Spring! Finally! In Vancouver, spring sunshine is often chased away by rain showers so all the more reason to delve into books which help transport us into nature and wonder with just a flip of a page, a beautiful illustration or a perfect written image. We found three perfect books which do just this on our library visit Saturday. I adore this book. 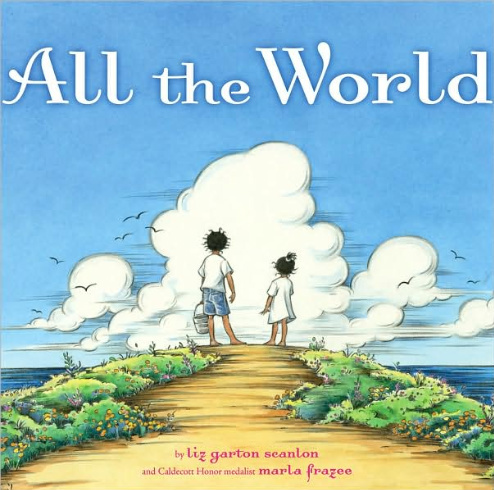 All the World is a Caldecott Honour Book illustrated by Marla Frazee and written by Liz Garton Scanton. Simple rhyming text pays tribute to the small simple things our world has to offer like a tomato blossom or a fire to take away a chill. But it also celebrates through Frazee’s absolutely gorgeous illustrations, the majestic purply sky at the edge of the ocean or a thunderous downpour that comes out of nowhere. The images are comforting, saturated with details and evoke our own memories attached to the experiences suggested by each picture. These pictures are so easy to connect to, I felt like I had taken a journey through some of my own most happiest of memories. 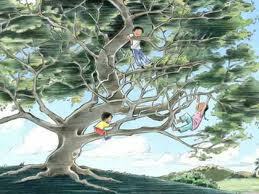 Climbing a tree in childhood. Visiting a farmer’s market and eating plump berries with my children. Racing through a rainstorm on a summer’s day in search of shelter. 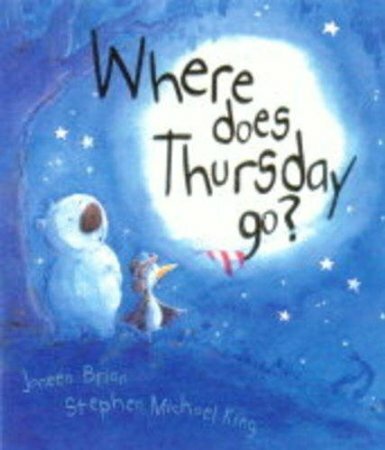 Janeen Brian and Stephen Michael King, the author and illustrator of Where does Thursday go? have created a lovely little tale of wonder and whimsy. An important question is posed, if Friday is coming, where does Thursday go? What happens to it during the night? Bruno doesn’t want his wonderful birthday day to end. He wants to say goodbye to it. He finds his friend Bert and they traipse through a blue star filled night looking for Thursday to say goodbye. When the moon rises up big, round and bright like Bruno’s birthday balloons, the two friends feel like they have found Thursday. They creep back into bed until the sun brings Friday. Sweet, illustrations on blue filled pages. Lovely. I especially like the image of the two friends on the beach at the edge of the sea where ocean and sky meet in swirly blues and whites. This book appeals to the urgency I feel when spring flowers begin poking through the earth. Tend. Nurture. Clip back. Transplant. Compost. Appreciate. Wow, can I connect to the main character in this story who nurtures a struggling garden into a majestic green world. 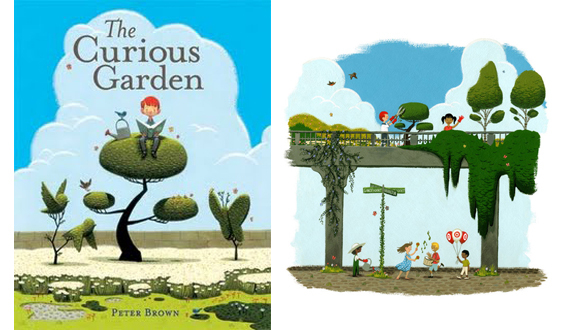 Liam, the little boy in Peter Brown‘s The Curious Garden resides in a dreary city where everyone stays inside. Not Liam. On one of his rainy day walks he finds a few wildflowers and tiny plants on some abandoned railroad tracks. He cares for this garden over several seasons – appreciating its natural tendencies to spread and travel and helping it along a bit too (hooray for guerilla gardening). Years later he can appreciate an entire green city, tended by a multitude of gardeners. Peter Brown includes an author’s note at the end of the story which explains his inspiration for the book. Escape into Spring with a poking about walk to the library and discover all the places you can find signs of Spring. This entry was posted in Picture Book Love and tagged favourite illustrators, fiction, library books, Marla Frazee, moon, nature, Peter Brown, picture books, Stephen Michael King by carriegelson. Bookmark the permalink.